I brake for ruffed grouse. Here's stupe. Her apparent interest indicates a certain recognizance. I was going to shoot this bird but I got caught up in the dogs' antics and shot this pic instead. The bird flushed. Richard gearing up bones. Bones is a pudelpointer named after the ruffed grouses' genus Bonasa. Richard at the walleye office. I'm sitting in the cabin. Feet up. Here's stupe. If birds hang on a barbed wire fence beside a dog and a broken down over-under in the field for too many pictures they just rot. Cut into strips and rolled in seasoned flour and pan-fried, these went good with a can of beer. The end of another opening day at the cabin. Richard felt it best to take the last few out of a 20 year vintage bottle of Beam given to him by his brother in law. 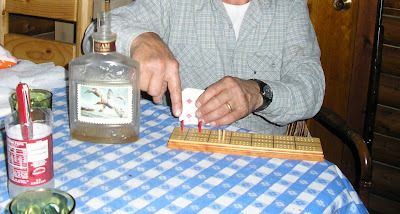 He also felt it best to point out his cribbage win. Alas, I took the rubber match. damn...now that looks like a weekend right out of a Gordon MacQuarrie book.